In order to break up the drive from Missoula, MT to Worland, WY, the Harrington duo decided to stop for dinner and a drink in Bozeman -- drinks first, of course. 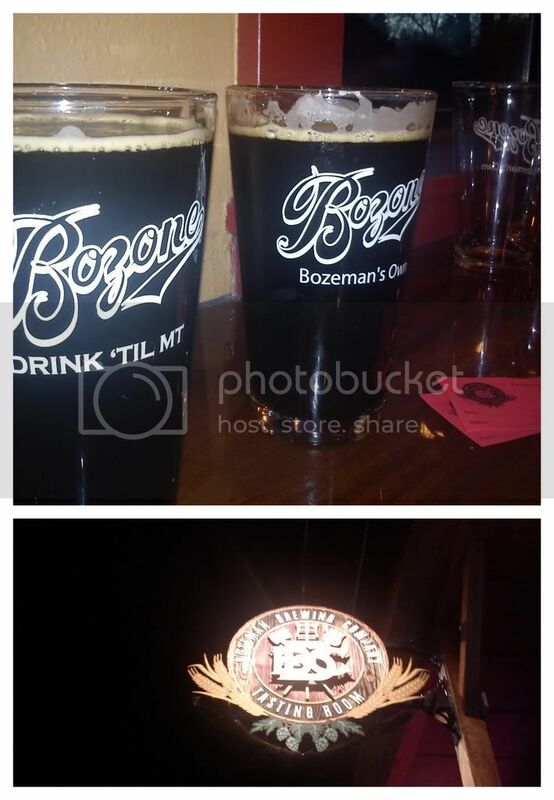 Since the couple had already stopped at 406 Brewing on the way to Missoula, the logical choice was to stop at Bozeman Brewing on the way back down. It was also obvious that the couple should call up their dear friend, Becca Skinner and catch-up on her wild and beautiful life. Much to the Harringtons pleasure, considering the positive experiences they'd had around the state, Bozeman Brewing was as incredible as desired. With something along the the Java-Coffee Porter or Stout lines, Melissa felt like she was entering that blissful place between a caffeine buzz and drink buzz. Meanwhile, Mike sipped on a CDA - Black IPA and the duo spent some time being inspired by Ms. Skinner and sharing their own plans for a wild and crazy future. As the couple pulled across the state-lines they knew that they had just enjoyed some of the country's best brews and were fully inspired for their home-brewing (and other brewing) adventures!